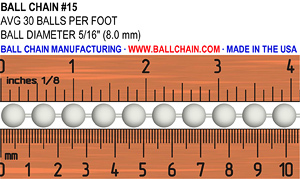 Our #15 (8 mm ball diameter) chain is commonly used in industrial applications. Also used in the manufacturing of our architectural design product, ShimmerScreen. 5/16" 8.0 mm 30 70 lbs. 120 lbs. CHECK 120 lbs.